Tonight was a “surprise” show from Nirvana and the Jesus Lizard at Roseland. Announced only two days prior, this was the event of the week. We figured it would be the only chance to see them in such a small venue, and we could hear them perform material from their long awaited forthcoming LP In Utero. Nirvana in N.Y.C. — maybe something to tell the kids someday. The Jesus Lizard was phenomenal. They thumped it out as tightly as ever as vocalist David Yow chain-guzzled cans of Bud. We had staked out some ground near the stage and helped Yow stay afloat during his many sojourns into the crowd. When Nirvana hit the stage, we were bounced back to the “old guy section” even though we were wearing sensible shoes. The only escape from the rampant teen spirit of the N.Y.C. youthful would have been the special guest area above us that seated the Kurt Loders and Courtney Loves. Anyway, the barrier-breaking trio turned in a set that was musically better than what I had experienced on ’91’s Nevermind tour. Included were new ones like Heart Shaped Box and older faves like School, and they also debuted their female cellist friend for some quieter moments. The show was a classic example of what Nirvana was all about, characteristically sloppy at points and brilliant at others. Kurt Cobain ended the show on the floor, drenching us with and basking in his guitar’s feedback. This magnet just showed up on the refrigerator one day a couple of years ago. (Audrey picked it up at Big Fun in Cleveland.) 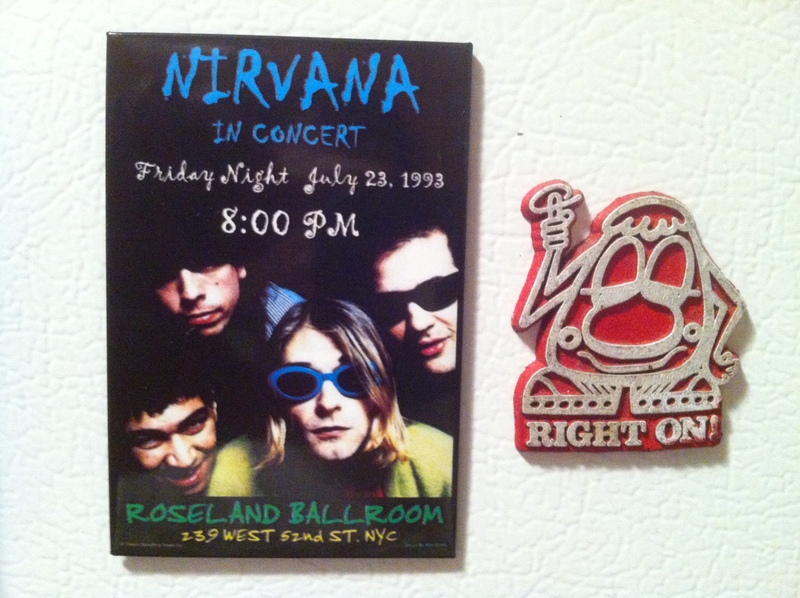 The realization eventually hit me that I was actually at the gig commemorated on the magnet. Note Pat Smear (pictured lower left) had become a touring member of the band which I failed to mention in the brief review. Nirvana would swing through our Northeast Ohio Region about three months later for a Halloween show at Akron University with their upstart labelmate Beck and their heroes, the Meat Puppets. I decided to sit that one out as my tastes leaned almost exclusively to smaller underground club shows. It turns out that that would be Nirvana’s last Northeast Ohio appearance.